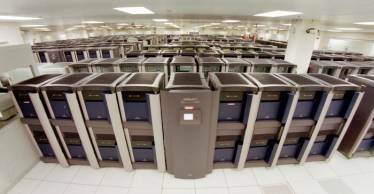 The Strategic Computing Complex (SCC) at Los Alamos National Laboratory (LANL) is a large supercomputing facility used to run complex nuclear weapons simulations. The secured 43,500 square foot computer room, which is roughly three fourths the size of a football field, is home to some of the Nation’s most high performance classified supercomputers. In 2014, LANL began construction of a new, first of its kind, supercomputer called the Trinity System which will require a switch from air to water cooling of the facility. The contractor performing the installation of the water cooling towers trusted Portland Bolt for the fasteners on the project. With our long history of manufacturing and supplying 100% domestic product to government and military projects, our comprehensive and complete certification packages, and our sterling reputation in the industry, the customer knew that they could rely on us to receive the correct product, on time, with all the certification documents in order. In one week’s time we shipped several hundred domestic ASTM F1554 Grade 36 all thread rod assemblies and their associated hardware complete with all the certification and testing documents required to meet the stringent standards of the Department of Energy (DOE) and National Nuclear Security Administration (NNSA). The Trinity System is expected to be the first system of its kind. While the exact specifications are classified, experts believe the system will be powered by upwards of 60 processor cores capable of 30-55 petaflops. A petaflop is one quadrillion floating point operations per second. By way of comparison, the average personal or work PC is capable of 0.000065 petaflops). The Trinity system is expected to go online in 2015-2016. Does your project have a domestic requirement? Call the experts at Portland Bolt!